Gentian grows wild in the high altitudes of the Alps. It contains some of the bitterest compounds in the plant kingdom. Even a few small drops are sufficient to stimulate bitter taste receptors. Its aromatic bitter qualities have made it a long-time patron of herbalists and the liquor industry. Gentian is primarily used as a digestive bitter to stimulate the release of stomach acid, bile, and pancreatic enzymes. 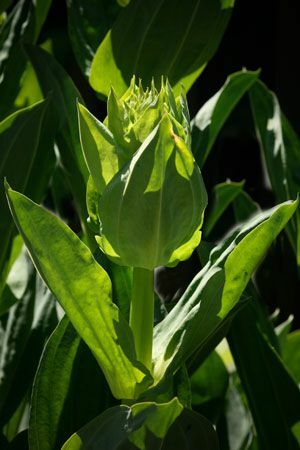 Herbalists prescribe gentian for “atonic digestion” when a person's digestive function has become sluggish or suppressed due to stress, illness, and old age. It also can be useful for those suffering from indigestion from over-eating resulting in heaviness, bloating and occasional reflux. Numerous "digestif" liqueurs, including Campari, Unicum, Aperol, Suze, Amaro, and Averna, rely on Gentian for their bitter taste. Gentian relieves some types of heartburn but aggravates others because it increases stomach acid. Gastroesophageal reflux disorder (GERD) often improves with Gentian because it helps tighten up the lower esophageal sphincter, increases saliva, and increase the rate that food is digested to promote the descent of food. Because gentian increases stomach acid, the herb aggravates heartburn due to inflammation of the stomach (gastritis) caused by H. pylori infection, and certain substances like non-steroidal anti-inflammatory drugs (NSAIDs) and alcohol.